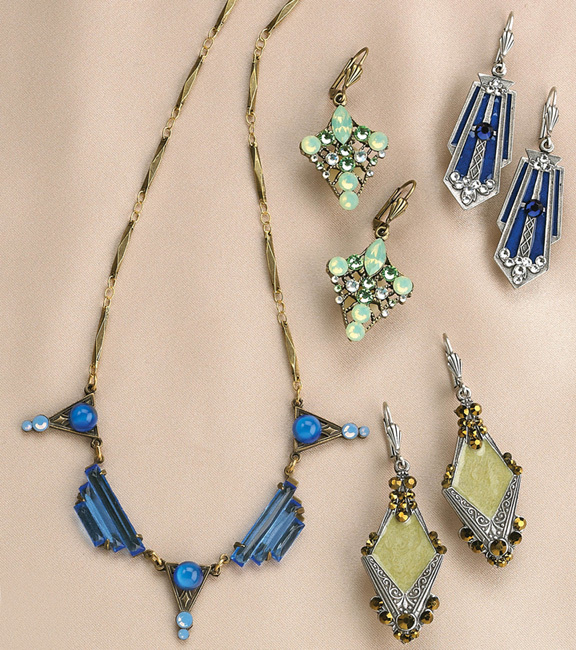 Lovely and elegant are two of the words used to describe these vintage look jewels. They start with great design sense and come to life with both period and carefully crafted reproduction elements, hand-made in New York. The 18” necklace features vintage blue glass pieces, and two kinds of blue crystals on a segmented bronze chain. Delicate pale green opal-like Chrysolite and sparkly Swarovski crystals make these 1-3/4” drop earrings (on bronze base) appropriate for daytime or dressy wear. Sterling plate over bronze is the background for hand-applied deep blue enamel with blue and clear crystals. The stepped shape is 2” long and very Deco. l The silver plate elongated diamond shape is over 2” long and decorated with scrollwork metal, cream color hand-applied enamel and topaz colored crystals. All earring wires are gold or silver plate over bronze, and all metals are lead, nickel and cadmium free.